This is the third of a series of blog posts commenting on tracked changes to the draft Elective Home Education Guidance for Wales. The public consultation closes on July 3rd. ‘It is advisable parents continue to engage…’ is meaningless. Passing reference to local council complaints procedure adds nothing. Need to spell out how it can be used – and escalated as appropriate – or else leave it alone. Sentence ‘in the interests of the wellbeing of the child…’ is redundant. Who would suppose the contrary? ‘The school and local authority may want to consider initiating a process of mediation…’ means nothing if the LA is not prepared to challenge the school. ‘The aim should be to achieve a positive resolution…’ is redundant. It isn’t a must-do, and anyway who would suppose the contrary? Cardiff Fair Access Panel doesn’t mention self-referral, also it seems panel can’t be accessed till able to prove ‘raft of measures have already been attempted’ so is not helpful in situations where school refuses to implement any changes. Unnecessary to have paragraph about parents agonising etc. The main message of the draft Guidance is annual monitoring and interviews with children, and saying something about sacrifices doesn’t make that any better. The likelihood of positive relationships within the proposed framework of annual monitoring is vanishingly small. Examples of good practice lack the necessary detail to be translated more widely. 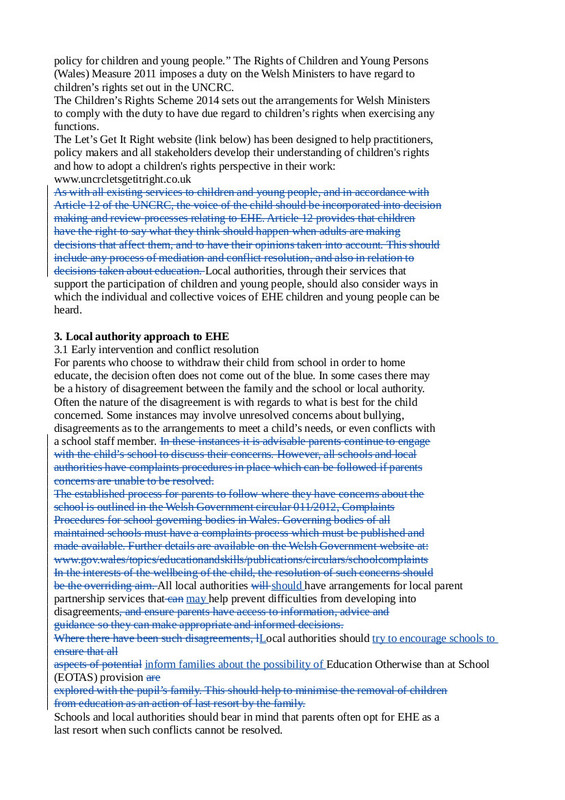 This entry was posted in Uncategorized and tagged annual monitoring, children's rights, illegal exclusions, offrolling, Welsh consultation, Welsh Guidance on June 27, 2015 by Fiona Nicholson.